He had been raking leaves, and putting them behind a stone wall. He thought the ring might have fallen off as he threw the leaves over the wall. It made sense, so I began my search behind the wall. 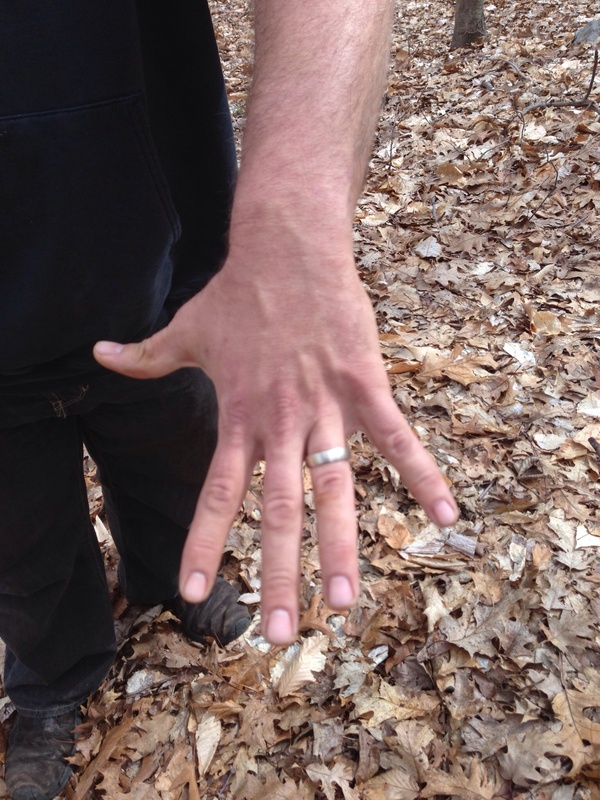 I was getting lots of signals, which turned out to be construction debris and the electric fence wire, but no ring. Not having any luck behind the wall, I continued the search into the yard. I was almost done with the entire yard area, and thought if I didn’t find it there, then I would return to the leaf pile behind the wall for another sweep. Right after that thought, I got a nice loud tone, and I knew it was the ring before I even looked. Sure enough, there under some brush, was the shining white gold band. I yelled out to Adam that I had found it. His face lit up–he was very happy and thankful. After the ring was back on his finger, he clued me in to the property behind his home, and the old cellar holes he had seen there. He brought up a map on his laptop and tried to show me the locations, but it was just too difficult to see. However, one of the cellar holes was fairly close to the house, and Adam was like–“I’m just going to show you, its not far”. A few minutes later, I was looking at an amazing maze of rock walls next to the foundation of what appeared to be an 18th century building; and Adam thought there might be more in the vicinity. How friggin’ cool is that? 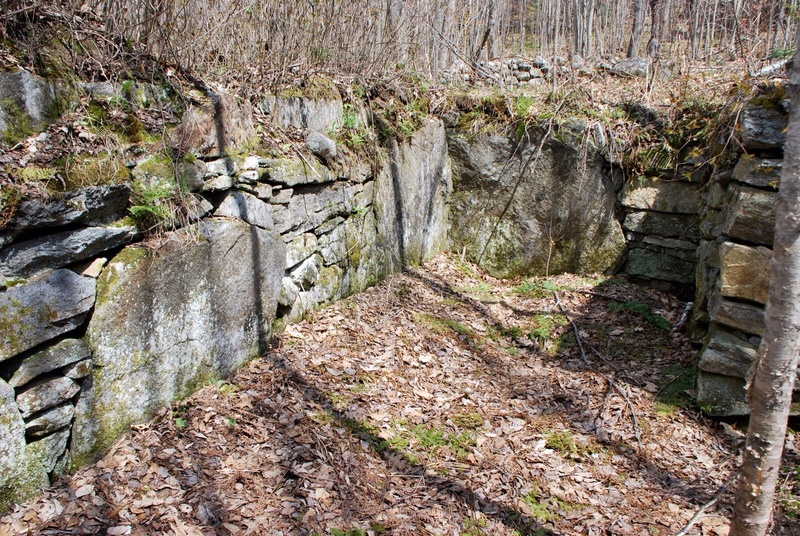 In addition to that cellar hole, he told me the locations of a few more he had seen while on hikes with his dog. I’m so glad that I was able to find Adams ring for him, and also delighted about the inside info he gave me on the cellar holes. We both walked away with treasure that day. Good job….look forward to hearing about your search of these new sites. Satisfaction all round – and good PR! Well done! Satisfying for you and great for the image of detectorists. I think most detectorists are more than willing to lend a helping hand. Reading your story made me think of the same thing my neighbor. I was in the yard one day wit my detector and my neighbor came over and ask me what I was doing so I told him I was learning how to use this new detector.